With all of this talk about Social Media Dashboards, I thought I would condense Aspiration‘s Building Your Own Social Media Dashboard slide deck into a blog post to show you how easy it is to start monitoring social media outlets for what you care about. What the hoozeewhatsit is a “Dashboard”, anyway? A dashboard is a kind of RSS reader that takes RSS feeds and arranges them on the screen so that it’s easy to see the content of multiple feeds at once in what are called “widgets” (Basically floating boxes of content). Dashboards can display other kinds of information besides RSS feeds, but for our purposes here, all you need are RSS feeds. 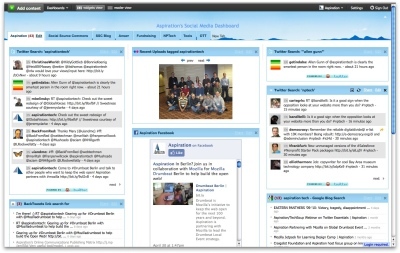 Why should I put together a Social Media Dashboard? The purpose of a Social Media Dashboard is, in one place, to easily and quickly find out when, where and what people are saying about you online. Once you put a dashboard together, it does all the work for you. You simply log into your dashboard and in front of you will be a collection of widgets that will populate with links when someone mentions you online. Monitoring isn’t limited to your organizational name either. You’ll be able to search for any search terms that may be important to your organization. Executive director’s name, your upcoming conference’s name, a bill you want to stop from getting passed. Eavesdrop on conversations about any topic or keyword that is important to you. If this sounds vague, it will make more sense as we go on. Just know that if you know when, where and what people are saying about you and your organization online, you can engage those people and join the conversation. How do I put together a Social Media Dashboard? Do a search for your organization’s name. on the right sidebar and it should take you the the search’s RSS feed which you can copy from the URL bar. Now, taking the RSS feed address we copied from the browser’s URL bar, we can paste it into our dashboard. More options fall down underneath the “Add Content” button. Netvibes then generates a widget underneath where we pasted in our RSS. When it’s done loading, click the green “Add” button and BAM, you have added your first RSS feed onto your dashboard. That’s all there really is to adding RSS feeds to Netvibes. I walked you through searching Twitter, but you can do the same type of search on many different sites (we recommend that you check out what people are saying about you in the sites listed in the Sites to Monitor box above in addition to Twitter). You just have to search for your org, find the RSS feed for the search and copy it into Netvibes just like we did with Twitter above. These search RSS widgets will now automatically update anytime a new result matches your search terms. They do all the work for you and best of all, you can add as many feeds to the dashboard as you want. Once you input the RSS feeds of your searches on these sites all you have to do is log into Netvibes once a day, once a week or two months from now and see what has been said about your search terms. The tricky part is finding where the RSS feed lives on your favorite sites. Be sure to look for the RSS icon or the words “Feed” and “Atom” which signal an RSS feed. I’m Monitoring Social Media…Now What? I'm in the process of tweaking my social listening dashboard in Netvibes and have run into trouble with the Social Mention RSS feed – it doesn't validate! Have you run into the same problem. I am searching for a phrase, but I didn't think that should matter. I've also used Ice Rocket, Tweetmeme, Favstar.fm (for Twitter favorites). Hi Kerri, I played around with it and yeah, it looks like there's some bug where Netvibes won't recognize the feed. It must be something to do with the notation in the RSS feed. I tried to pull an RSS feed from a phrase and it gave me no results in the widget. However, when I tried that same phrase in quotations and pulled that feed into Netvibes, it worked. Would that be a possible work-around for you? 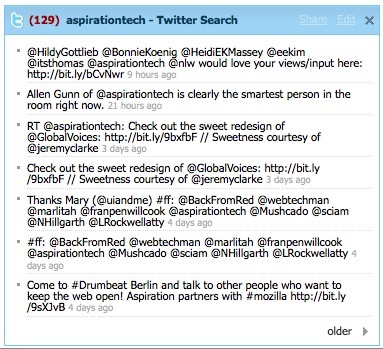 Social mention has been having all kinds of problems generating RSS feeds .. have you found a free replacement? Supercool Matt, thanks. Been wanting to try netvibes for a Luddite friend, but couldn't make sense of it until now. Thanks, Leo! Yeah, we get a lot of use out of Netvibes just listening in on what people are saying about us. Be sure to let me know what you think once you're up and running. I’m glad you found the information useful! A social media dashboard is a great free tool that can make the 17 billion conversations going on around the web a little more filtered and feel a little more tangible.